This unit has been created to make any teacher's life easier. Print and go (NO PREP). It's teaching made easy. 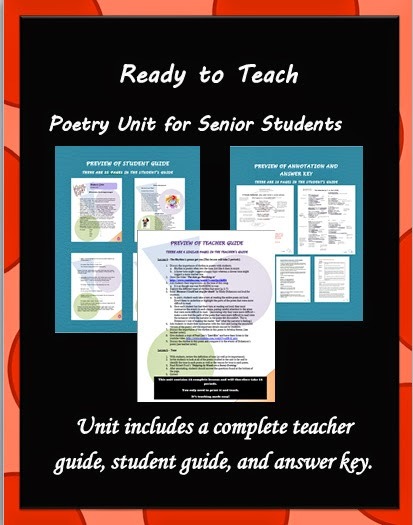 Poetry Unit (Bundled) is appropriate for use with students in grades 11 and 12. I use the first section (lessons 1-6 with my grade 11's and do lessons 7-12 with my grade 12's). This unit’s focus is the analysis of poetry and teaches students how to make inferences with poetry, which is a skill they must learn for their other subjects as well. This unit is also suitable to teach in Advanced Placement classes (in the beginning stages). The unit includes a teacher guide with complete lessons, a student guide, ready to be photocopied and given to students, and a final evaluation (which does not include an answer sheet because of the open nature of the evaluation). The final evaluation is a test that evaluates students’ ability to analyse poetry. The unit has been conceived to last 11 days – with 65 minute periods (although they are easy to modify). 3 – The answer and annotation Teacher Pack, which annotates all of the poems within the unit (saving you time). A total of 63 pages are included in this package.